We’re flying through the skies above the Maldives on a seaplane, counting islands and appreciating the cerulean beauty, until, 45 minutes later, we find ourselves over one that’s shaped like a turtle. The aircraft’s nose pointing downward, we descend to the pearl-white shores of Velaa Private Island, where on landing we’re greeted by a line of staff, all neatly turned out in white linen. Strange to say, I’m in the Maldives for one thing only, and that’s not to swim, to sunbathe or to dive. Instead, I’m here to dine at the private island’s Aragu restaurant, whose name is derived from a local Dhevi word, which means Essence. 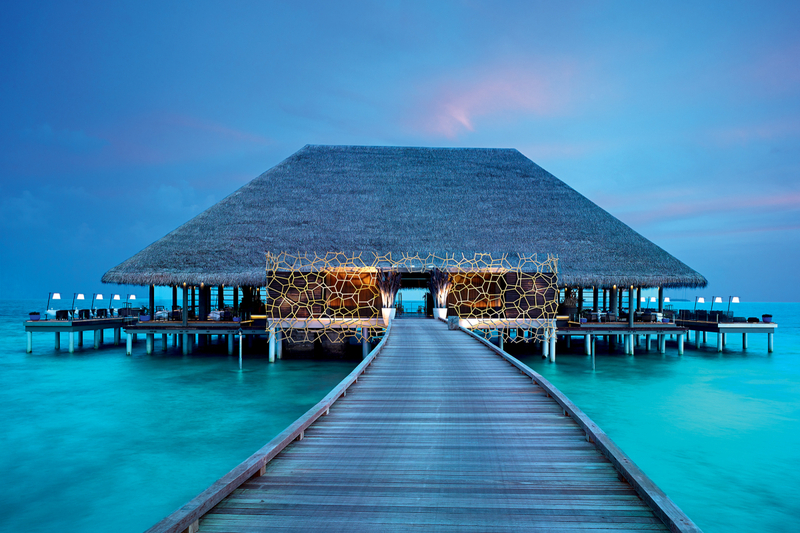 Perched on stilts above the water, it’s a place where you truly feel as if you’re right in the middle of the Indian Ocean – which, more or less, you are. To add to the air of blissful isolation, we sit – glass of Champagne Delamotte Blanc de Blancs in hand – as the tinkling of a piano echoes through the vast open dining room to an accompaniment of gently lapping waves and a refreshingly cool breeze. Here we meet Sri-Lankan-born Chef Gaushan de Silva, whose passion and expertise are about to add further magic to our experience. A veteran of 24 years in the industry, Gaushan’s culinary repertoire has been honed through stints at the Hilton, Mihiri and Huvafen Fushi – all in the Maldives – as well as the Royal Palace in Jordan. Just before he moved to Velaa, he further perfected his skills by working with some of the world’s most admired culinary masters, including Alain Ducasse, Adeline Grattard and René Redzepi. Guashan tells us how the molecular dining landscape has completely changed, saying that now it’s always about “letting the main ingredient speak for itself”, and the quality of products used. What inspired you to change your menu concept? Thousands of consommés are made on this island. When I dream of something at night, we make it. Say, seaweed consommé or Peking-duck consommé – we create it once we think about it. There’s always something new. That’s why we’ve taken a risk to change things. Some people want to have a proper plate, vegetables and starch – we still have that on the island, just in a different restaurant! We want to introduce this menu to them – still simple – using a base of fantastic ingredients with an Asian twist. Which dishes in this new menu are closest to your heart? My favourite dish is the pigeon – I really love it. You get the sweetness from the Blackberry reduction, you get the pigeon juice to infuse the fruitiness. I extract the blueberries, the blackberries to balance the acidity coming from the red cabbage. How do you choose your catch? Do you include sustainable practices on the way you make your food? I buy a lot from the nearby islands, such as our beautiful bananas and chilis, and curry paste made by some local ladies. And, of course, the tuna – it’s just so fresh, that’s the quality and luxury part – we have so much of it in the Maldives. I’m very picky with my catch and don’t buy certain sizes. Say lobster – we choose six-and-a-half or seven inches, and we don’t buy female lobsters with eggs. People used to just buy whatever, fishermen would just sell us what they had – this was back in 1997. Now we want to slowly change their mentality in a sustainable fashion. The great thing about fishing here is that it’s all line caught. No one is allowed to catch fish here using a net. We have a recycling plant here, and our landscape manager takes the lead on our waste-management system. I also use top-quality village eggs – the best you can find. I could easily get them from France, but we do try to support the neighbouring islands here. What are your biggest challenges on the island? It’s really about the discipline and the people around you. As Velaa’s executive chef, I need to trust my other chefs to recreate these dishes in such a way that they’re consistent, exactly the same as the original. Trust is built later on, as we work shoulder to shoulder. You talk a lot about discipline and training your staff. Do you think being a chef can be learned, or is it a gift? It’s a gift and, plus, a dedication. It’s also hard work. You need to know all the basics even if you’re gifted. The gift comes, but you’ll see the time and effort as a chef. That’s the amazing thing about Gordon Ramsay. If you work for him, you come out a solid guy. He won’t just tell you you’re a chef de partie – you have to work in one position for four or five years and prove yourself to him. My cooking philosophy is to cook with my senses, what I feel, what I smell. Simplicity. It’s always the hardest and most challenging thing to make – it’s easy to add all sorts of ingredients to make a dish more refined and elevated, but to keep it simple and make sure each ingredient is of top quality – that’s what talented chefs do. Also, I can’t forget about discipline and consistency. Many people try to take the short cut – but the best things in life are made with finesse and patience. I’ve been in this industry for 24 years – my first salary was from scrubbing the floor, working 18 hours every day. Some people come and can’t even cut up an onion properly. When people apply for a job, I just ask them for two things – one is to make an omelette and the other is hollandaise. If a chef doesn’t know how to make a proper omelette, how can they teach another person how to? What are your top three restaurants in the world? A simple Peruvian restaurant in London called Chicama, for the consistency and the beautiful quality ingredients thrown into an amazing dish. I put one bite in my mouth and the burst of flavours always gets me. Another favourite is a one-Michelin-star restaurant in London called Trinity, where you’re charged £50 for a four-course menu, I couldn’t believe it. It was absolutely delicious. On my second trip to London I went to Dinner by Heston Blumenthal, where the atmosphere was classy and modern, and the food was just amazing. My top three cuisines, though, where I want to end up would be Vietnam, Mexico and Japan. To go to this 90-year-old Sushi Man where there are only nine seats is next on my list! If you had the chance to cook for three people, who would they be? First of all, my absolute idol is Thomas Keller. It all started with his book, The French Laundry Cookbook. I remember saving my money to buy it – I’d go home and read it all the time. His dishes were so clean and refined – no drama. I always thought that one day I wanted to be like that. My second would be Alan Ducasse, of course, in his kitchen at Plaza Athenée in Paris, where I was so lucky to train for a month. I have so much respect for what he’s achieved. It’s not easy to impress this guy. Then there’s René Redzepi, who has a completely different style. He’s my age, I worked with him for a whole month and I’d love to prepare dinner for him. What’s next for dining at Aragu and Velaa? We’re opening a restaurant in the UK, called Velaa. It will feature contemporary European cuisine with an Asian twist. We’re all travelling a lot – we’ve done pop-up kitchens in London, Moscow, New York and Sicily – we’re definitely doing more.